STAR Social Analytics are highly accurate. They can track virtually any action and tie it to a respective campaign or user. It also helps us automatically reward the most active users and influencers. Schedule posts for a specific time or location. Post on multiple Facebook and Twitter pages. Choose countries and languages you want to reach. View posts, likes and comments on your pages. Moderate posts and delete inappropriate comments. The Facebook classic does exactly what is says on the tube! 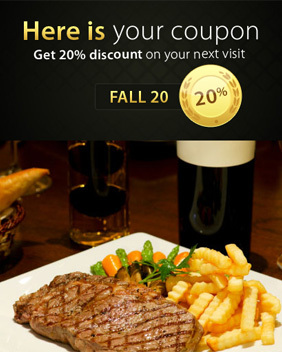 Reward your fans with a coupon, they deserve it! Created by popular demand, Movie Page template gives your Facebook Page the basic tools to help you engage your audience within your page. 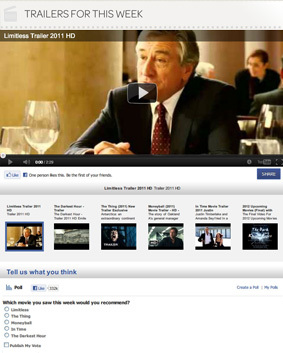 Show your trailer and a selection of other videos and give your fans the option to express their opinion via Poll and Facebook Comments. 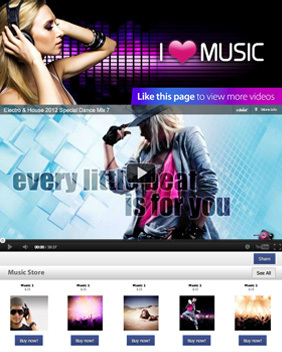 Music Store is essentially a storefront with a video that enables you to showcase and link to items in your eshop. Great for bands who want to boost their music sales via Facebook. The combination of a YouTube video and a small storefront makes it very re-usable for showing and selling any kind of merchandise. If you want more features, have a look at the Merchandise template. Shops and brands alike use this template to let them add a storefront layer to their Facebook page and help drive traffic to their e-shops. This simple template requires no programming and is one of our most used templates. Advanced template for showcasing brand merchandise and content. 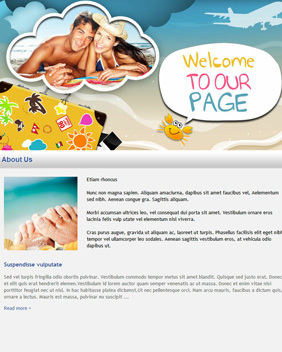 This template is often used by sports teams and other brands, which have highly committed fans and customers. It's useful for anyone, who wants to display YouTube videos, small storefront linking to an e-shop and to impress their fans. A helpful template for using the power of Facebook to drive customers to your e-shop or your retail location and showcase your most attractive merchandise. A very helpful tool that will let you hold a sweepstakes campaign for your fans. The template will let users sign up, opt-in and will provide you with the necessary user data to hold a sweepstakes campaign. For maximum effect, we suggest pairing it with a Facebook Ads campaign. One of our favorites, this template is highly versatile enabling you to link to your most engaging content and promote you blog, company newsletter or feature a FAQ/ Help section right on your Facebook Page. One of our most popular templates! Video Gallery enables you to showcase your YouTube videos in a playlist, so your fans can see the content you produce for them. Great for pages promoting films or brands investing time into producing tutorials. Highly versatile template that will let your fans share your content - be it small gifts, seasonal postcards or get well wishes and help you spread the word about your services/merchandise. Heavyweight Facebook pages will appreciate this template. Microsite enables you to feature multiple tabs within a single Facebook tab and thus extend your page to be able to feature a lot more content. The Facebook Invite will give your fans the chance to send a Page Invite to their friends and spread the news about your page. Great tool for growing your fan base. Show your fans how their friends interact with your brand on Facebook and inspire them to be active too. This plug-in will display users friend's activity in your tab. 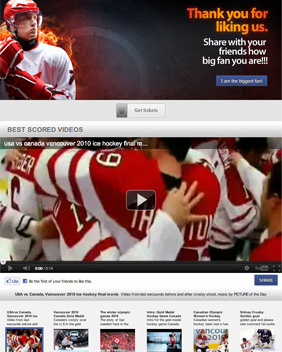 Add a share button on your tab and allow your fans to share your content between them. Choose the URL you want them to share and you are good to go. Neat thing: You can personalize your share button too. Insert the classic Facebook Like button into your tab and give fans the option to like specific content. This plug-in is the easiest way of how to enable your fans to add comments on your tab. Really handy and simple to use. Just choose the number of comments that can be displayed and the color scheme and you're good to go. Create your own Facebook Event Calendar Tab with this plug-in. Use our other plug-ins to provide extra information - add a trailer to a film night or songs above a party invitation. Present multiple products or information via Slideshow in one area. Assign each slide an individual action and create tailored presentations to inform and engage your fans. Grab the attention from your fans and visitors with a YouTube video. With this plug-in you can embed trailers, tutorials or any other kind of video from YouTube straight to your tab. Engage and entertain your fans and visitors with a Vimeo video. This plug-in lets you embed your Vimeo videos straight to your tab. Displaying documents has never been this easy. Embed presentations, spreadsheets, and more through publishing service Scribd. Let your fans download important files via this plug-in. You can upload files from your computer and let your fans download them via a link on your tab. This neat plug-in allows you to display a gallery of images on your tab. With one click, the image pops up in a highlighted window with a caption and you can browse the gallery. This plug-in allows you to create a video slideshow from your Vimeo and YouTube videos. With this plug-in you can add one or more mp3 files right on your tab. Stack them up and create a music player or just add them where you want to accentuate your content. This is a great building block for any music page. This plug-in will let you upload your video file and publish it on your tab. With Facebook sharing enabled, users will be able to share your video on their profile. This plug-in will make your page look quite impressive without any effort at all - it enables you to add a dynamic carousel presentation to your page and showcase your best products or images in a very sleek manner. Trust us and try it yourself, it is very easy to set up. 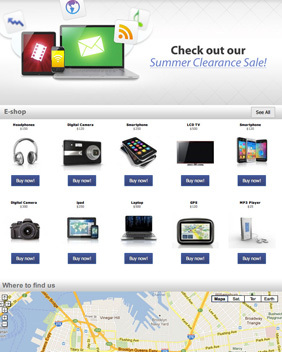 Create an online storefront with neatly organized products or services. One click will redirect your customers to your website where they can proceed to purchase or get more information. This simple plug-in allows your fans to contact you via the trusty contact form. Handy for directing fan communication to the right mailbox. A map always comes handy! Display the location of your business or directions via Google Maps and let your customers find the way to your office or store right away. 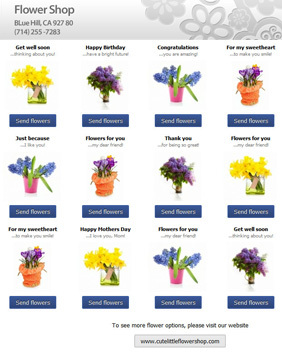 This plug-in will enable your friends to send little virtual gifts from your page to their friends. Great way to promote your products! Ask your fans what you want to know! Poll plug-in lets you import and select from your existing polls created in Facebook and it's the easiest way to get measureable feedback from your fans. This plug-in allows you to add a fan meter, which will visualize the growing number of fans on your Page. You can also adjust the size and design. Make sure you read the help section to help you set it up. This plug-in packs quite a punch! 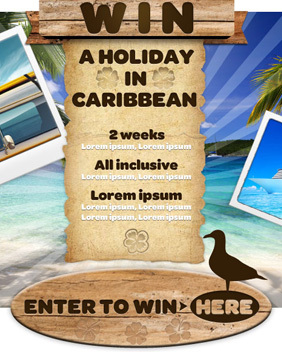 Use it to create a simple sweepstakes campaign for your Facebook page. Complete with opt-in, user sign-up and space for your Terms and Conditions, it is your fastest way to a Facebook campaign. We suggest pairing it with Facebook Marketplace Ads for best results. Use picture widget to add separate pictures or complex creatives to your tab. Each picture can be set to have an individual action, such as Like, Share, or URL destination. With the Paragraph plug-in you can insert text fields wherever needed with a few clicks. Link plug-in allows you to easily add a text link or a button to your tab without the need to use HTML tags. iFrame plug-in lets you insert and display content from an external website in a simple iFrame window. With the HTML plug-in you can insert or edit concent of your tab using the HTML tags. This plug-in lets you design your own navigation for your tab. You can create a drop-down or horizontal menu and display different views of your tab content. Use this versatile plug-in to display information in a pop-up window that opens with a click on a button. Great for clean product displays or help information directly on your tab. Good Tip: You can add a link to your pop-up box by using the HTML tags. This plug-in will add a simple table to your tab. Great for displaying structured information, such as prices. Images and links can also be added to your table. This plug-in enables you to add a simple Twitter feed to your tab. The feed will display all tweets from the username you provide. You can also set the number of tweets displayed. Show your customers and visitors that you have specialist knowledge and the most up-to-date information. 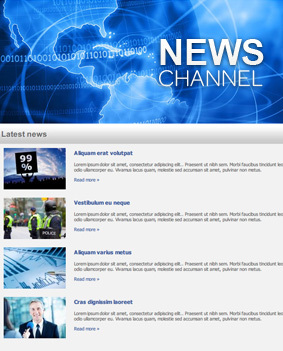 Provide them with interesting news from your industry, business or everyday life. This plug-in will display an RSS feed on your tab. Fans will be able to share, like, tweet or message the content as well. 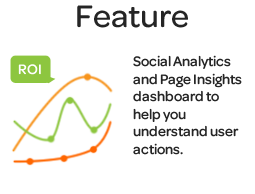 Social Analytics is a section within STAR Social. It allows you to monitor multiple campaigns across multiple channels (not only Facebook) and measure your ROI. Everything you need to publish engaging content at a great price. We're more than happy to help you out with using STAR Social. Please use our Facebook wall or tweet us and we'll get back to you as soon as we can. 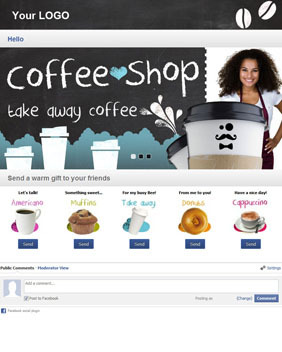 Our team of developers and designers can create custom Facebook apps from scratch to suit your specific needs. Don't hesitate to contact us if you need to improve your apps functionality or would like to incorporate one of our templates and plug/ins. We're happy to tweak them for you for a fixed price. All work copyright © 2010 - 2019, Kremsa, Inc.